The recent black and white photo exhibit at the Indian High Commission premises, Dhanmondi, stirred up the imagination, thoughts and memories. The black and white photos were dramatic and artistic to say the least. Although not taken by professionals, presumably, they were soul-stirring. Sheikh Mujib writing in visitor's book prior to withdrawal of Indian troops from Bangladesh (left). And General Niazi surrendering to the Indian General Aurora on December 16, 1971 (right). The photographs brought in the subjects, as well as the enveloping landscape around. Hence, one got a good taste of the scenic effects of the historic events: This included famous personalities -- who were heroes of the Liberation War -- Indian "jawans", Bangladeshi onlookers, the hapless people killed in the genocide of 1971. Bangabondhu Sheikh Mujibur Rahman and Lt.General Aurora of the defending Indian army in the then East Pakistan and their families were in the spotlight of the exhibit. The common people too were often in the limelight so that the drama of the Liberation War had included the average soldier -- whether Indian or Pakistani --and the overwhelmed prisoners of war (POW), as well as the dazed Bangalee onlooker. The inclusion of the carcasses of the Bangalee victims of the genocide were not repulsive or frightening. One could take them in one's stride, as events of the past. They stirred up one's feelings. Yet, one didn't shake or cringe with horror. It was as if the photographers had seen the images behind some pale tinted glasses. As the pictures were contained in two rooms, accompanied by clearly typed footnotes, the gallery visit was not tiresome in any way. One took in the photo exhibit within a spell of minutes. 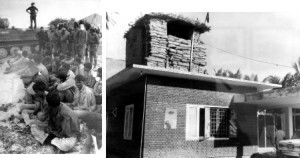 One of the photos saw Sheikh Mujib's residence, with a Pakistani bunker on top of it. Coconut leaves waved behind, while people appeared to be going about their everyday work, with the inclusion of a car. The waving flag atop the sand bags lent interest of today, yesterday and tomorrow. If one were to compare this with scenes around Bangabondhu's residence today it was interesting and evocative. It satisfied one's curiosity apart from whetting one's appetite for historic scenes. There were also scenes of the Bangladeshi victims of 1971. This ushered in images of cruelty and heartlessness: To the last point and beyond, one saw corpses with bare torsos, limbs and visages of what appeared like dumped, rag dolls. They were scattered on the sepia foreground with waves of pale grass. They had died in a cruel manner, but not in vain. In the second picture -- the retreating Pakistani army had been included -- and one got more details of the horrific war scenes. There were helpless bystanders too, with weapons in their hands -- looking backwards and ahead, shocked by the ruthless genocide. A large crowd in Comilla was shown in the next entry. They appeared to be rejoicing with unabated glee and passion, at the liberation of their town by the Indian forces. Here we saw wildly waving hands, wide grins and gleeful smiles. Most of the jubilant visages faced the camera. Sikh soldiers with their turbans stood out. The picture was an image replete with rejoicing. The Pakistani prisoners of war, in the next picture, appeared somewhat cowering, but yet full of inherent arrogance. Lt. Gen. JS Aurora, GOC of the Eastern Command, was included in the focus. The local population abused the prisoners with strong disapproval, anger and disgust. The focus was both on the defeated and the victorious. The pictures on the procession being taken out in Chandpur, in 1971, presented a truck carrying prisoners. The truck was surrounded by trees, a lake mass, the overhead sky, with scudding clouds, and finally the people -- seen in miniscule size. The group of 106 POWs were in focus in the next image which was shot against the sun. The proud faces, even in defeat, reflected the shameless attitude of the invading army -- directed by the short-sighted General Yahya Khan. The POWs had their hands akimbo although they appeared lacking in bravado. The final signing of defeat at the entrance, the piece de resistance of the exhibit, adorned the entrée to the superb display. Here one saw Lt. Gen. JS Aurora -- splendid in his uniform, sword at waist -- surrounded by representatives of three Indian forces, and of course General Niazi. The not-at-all-happy, defeated head of the invading forces, the cameramen snapping the unique and memorable scene -- as well as a huddle of other jubilant personalities-- were all presented in an impeccable manner. The viewer left the Indian HC premises with a sense of satisfaction to have viewed the superb and historic photos -- once more with feelings!